One of the beauties of running an online business is that location doesn't really matter—yet, not many web builders offer the option to easily run a website in multiple languages. Voog has the option, and while it doesn't handle the translation for you and requires some rebuilding, it's still one of the simpler platforms for building a multilingual website. But even for business owners that don't need multiple translations, Voog offers a few additional perks, like an easy to use platform and an integrated blog option. It doesn't yet have an embedded store (that's coming sometime this year), but is one of the best options for running a site in multiple languages, or just business owners that want a simple, inexpensive website builder. Right away, new users are presented with a handful of templates to choose from. There are only about ten options, but they're well-designed. The overall look and feel of the themes are rather reminiscent of a high-end fashion magazine and all sport a clean look. While there aren't as many options available, there appears to be enough to suit a variety of business types, from brick-and-motor stores and restaurants to blogs. After choosing a theme, new users sign up with just an email, password and domain name (which can be changed later). A true drag-and-drop style editor, a toolbar at the bottom of the screen organizes options for adding new elements to a page. Two tabs make up the bulk of the elements that can be added. The first is content, which offers users the options to add text, a gallery, form, movie, map or HTML code. The second tab, files, holds user-uploaded items like images, which makes it easy to add the same image in multiple places. To add a gallery, for example, users drag the gallery to the desired spot on the webpage—that will create an empty space for images. Then, users head to the files tab and drag the desired photos to the gallery space. The template is already set up with a few empty content areas, but they can be easily adjusted. To delete an empty “Add pictures here” space, click and hold, then a trash can icon will appear in the corner of the screen. Toss it in the trash via drag and drop, then the page length with automatically adjust. Adding a new element will adjust the page length for you again, so pages can be made as long or as short as you need. To add a page not already included in the element, simply click on “Add” in the navigation bar of the website. Pages have three options: blog, common page (or blank) or home page, which will set up the page with some existing content, or no content at all. Pages can be easily reorganized (or deleted) under settings. Voog has an integrated blog platform that is extremely simple to use. 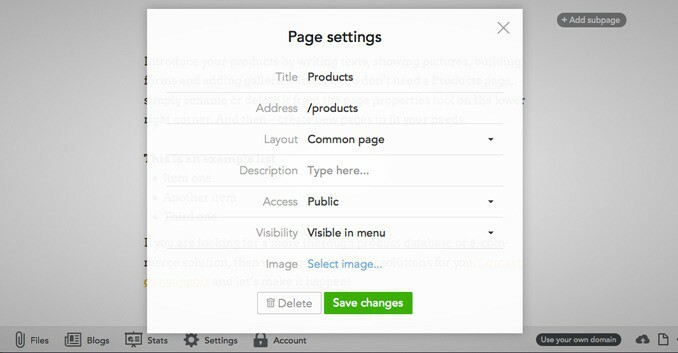 Just add a new page and choose the blog option if you don't have one already, then access the blog tab in the toolbox. Existing posts are listed here or can be easily added to the plus sign. When adding a new post, users simply fill out the title and the body. Images and other files like videos are added right into the body, much like adding an image to a Microsoft Word document. The option for tags helps organize posts, and Voog will automatically add comments form at the bottom of each post. Easy peasy. Unfortunately, Voog doesn't have an integrated store option just yet, though developers say that is coming sometime in 2015. That doesn't mean selling on Voog is out of the question either, though. Users can use a third party platform such as Ecwid, Snipcart or simpleCart to build their store, then copy and paste the HTML code into their Voog website. Unlike other options such as GoDaddy, third-party widgets are not added using drag-and-drop—users have to instead drag and drop a place for HTML code, then copy the code from the third party widget. This might be a bit confusing for inexperienced users, and it certainly isn't as easy as using a platform with an integrated eCommerce option. But if the design and multilingual features intrigue you, it's certainly not out of the question to sell products on Voog. It will be interesting to see how that changes once the shopping platform is released sometime this year. 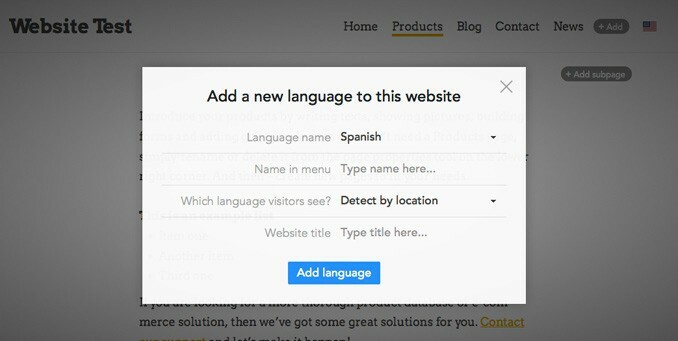 Voog isn't the only website builder with the option for multiple languages, but it probably has the least amount of steps to get there. For example, Wix suggests users go through the steps of creating a subdomain where Jimdo, GoDaddy and Yola tutorials recommend creating a complex navigation bar that includes all the desired languages with subpages. On Voog websites, the upper right-hand corner will have a flag on it, where visitors can change their language preferences. Or, even more importantly, website builders can choose to have the language selected automatically based on a visitor's geographical location. While Voog probably has the easiest multilingual integration we've seen so far, it's certainly not perfectly simple. Automatic translation creates blatant errors that visitors will notice—so Voog doesn't include that option. Once users add a new language option, they have to rebuild those pages, though since they're already listed, it's easier than other platforms methods of creating complex navigation with subpages. Unfortunately, users have to re-add images as well, not just text. Voog designers, if you are listening, we'd love to see each page copied exactly so that everything doesn't have to be rebuilt—just the text and anything else that might vary based on language. All that aside, Voog is still one of the simpler options when it comes to creating a website in multiple languages. Voog is a simple website builder that creates multilingual websites with high class style. Online store owners will want to wait until the new eCommerce platform is added sometime this year, but for business owners looking for a content-based site in multiple languages, Voog is one of the top options. There's not quite as many templates or widget options, but it's simple to create a well-designed site. The help center is open 24/7. Users don't even have to open a new window to ask a question—they can type a quick message without leaving the website editor. Our message received a response about seven hours later and was well-detailed. A basic Voog package costs $9.05 a month (8 euros) with up to 30 pages in up to three languages. For larger sites, the $15.83 option (14 euros) includes unlimited pages and a free domain name. Discounts of about 25 percent are available when purchasing a year at a time. Overall, our favorite part of Voog is the language feature, though there's something to the simplicity of their platform and designs as well.